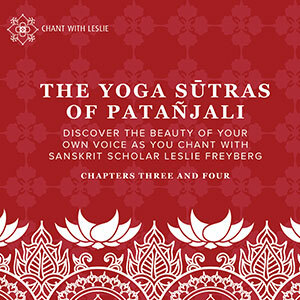 Announcing the Yoga Sūtras of Patanjali Chapters Three and Four, chanted and taught by Sanskrit scholar Leslie Freyberg. This learning program has helped many students of yoga find their own chanting voices, and learn the Yoga Sutras. You will too! There are three sections: Learn with Leslie, to hear and repeat; Chant with Leslie, to chant along; and lovely Sanskrit songs. 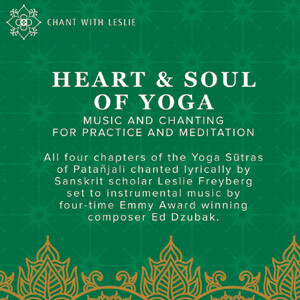 All four chapters of the Yoga Sūtras of Patañjali chanted lyrically by Sanskrit scholar Leslie Freyberg set to instrumental music by four-time Emmy Award winning composer Ed Dzubak. This instructional CD features Leslie Freyberg using her call and response method to help you learn the required Yoga Sutras for the Iyengar Introductory Certification. Available on CD only. Order via PayPal link below. 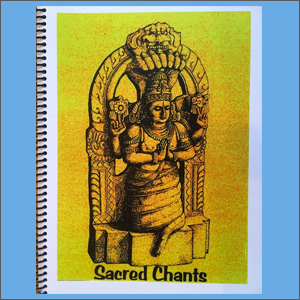 Sacred Chants is a helpful collection of the words and translations for many chants, in a neat, spiral bound, letter-size book. Included are all four chapters of The Yoga Sūtras of Patañjali, both the Sanskrit and BKS Iyengar’s English translations, but no commentary, so they are easy to follow along with while chanting the sutras. The Invocation to Patañjali and other commonly heard chants are helpfully broken down with translations, often word-by-word, so you can both see and understand what you are hearing and chanting. Many of the chants or songs that you may like to learn or practice on your own are included in this useful book.A Sanskrit alphabet and pronunciation guide at the end of the book can help your learning and practice too. Because it is spiral bound, it stays flat on its own while you are using it. Cost is $26, including shipping to US addresses. Leslie’s newest recordings are available as MP3s and all recordings are available on CD. After the invocations, each sūtra is presented on the track whose number corresponds to the number of the actual sutra. For example, sūtra # 1 of the first pada, or chapter, is on Track # 1, sūtra # 2 on the second track, and so on. On each track, listen to the sūtra in its entirety. Then, you will hear each word followed by a pause. In that silent pause, repeat the word. Continue this repetition exercise until the last word. Then listen to the entire sutra again and repeat it in the pause provided. If you’d like to chant the whole pada, or chapter, through without pauses or repetition, play the middle section. At the end of each CD a few mantras and verses from various Sanskrit texts have been recorded for your enjoyment. For those who wish a more comprehensive and detailed learning experience we have designed a companion booklet for that purpose. May you find peace and contentment in the yogic practice of chanting the glorious sūtras of Patañjali.